Recognising that incontinence can be a 24 hour problem, we offer a range of high absorbency Washable Chair Pads that come in a range of complementary colours to suit any decor. 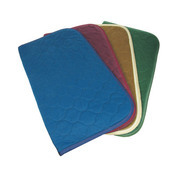 All of our chair pads have non-slip backing, as well as being fully machine washable. Chair Pad 21" x 22"